Delhi is a city with innumerable heritage structures that are the reminders of a great past. In such a historical city, one has a lot to explore. There is one such mystical place located within the city, yet far from the bustle of city life! It is none other than the ancient stepwell Agrasen Ki Baoli. One would get startled by its haunting beauty and rustic charm. The deeper you go, the far you are from the outside world. Agrasen Ki Baoli is a protected monument and one of the must visit places in India. It is said to be a haunted place but experiences differ from person to person. However, its beguiling architecture silently calls for our attention. Agrasen Ki Baoli is not just an ancient stepwell but there are much more interesting things to know about it. So, here we are listing out some absorbing facts about Agrasen Ki Baoli which will leave you spellbound! Scroll down for the photo tour. We are sure you will love it! Agrasen Or Ugrasen Ki Baoli? Legends say that this stepwell was built by the King Agrasen, which is derived from Ugrasen. Even today the name plate at the entrance says 'Ugrasen Ki Baoli'. Built During The Time Of Mahabharat! It is said that the King Agrasen lived during the time of Mahabharat and the stepwell was built during this time. However, they haven't found any proper evidence to prove this theory. Historical records say that Agrasen Ki Baoli was rebuilt over the old stepwell by the rich Agarwal Community, who are said to be the descendants of Maharaja Agrasen. So, today's structure belongs to the 14th century during the rule of Tuglaqs in Delhi. Agrasen ki Baoli is one of the surviving ancient stepwells in Delhi. It is now a protected monument under the Archaeological Survey of India. Agrasen ki Baoli is definitely an architectural marvel. It has three stories and 108 steps which goes down to the well. 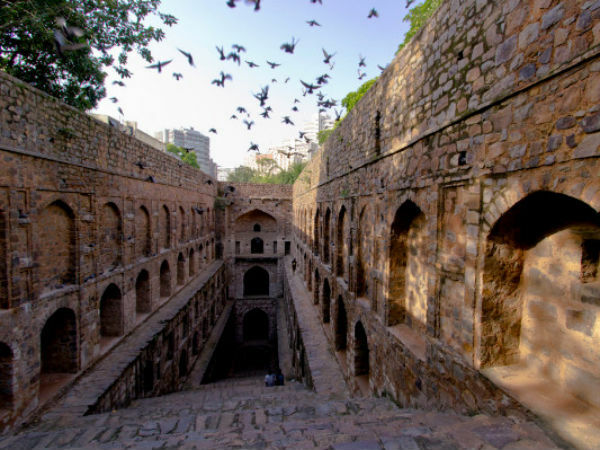 Agrasen Ki Baoli also has a resemblance to the baolis or baodis (stepwells) in Gujarat and Rajasthan. The water inside the well of Agrasen Ki Baoli is said to hypnotise people and allure them to commit suicide. It is said that the well had black water, which mysteriously killed people. We do not know how far these stories are true, but the well is almost dry these days. There have been no reports of suicide inside this well. Haunted Or Home To Bats And Pigeons? Agrasen Ki Baoli is said to be one of the top haunted destinations in India. Some people have said that they have heard strange noises and witnessed apparitions. However, no one knows the truth. It is mostly visited by tourists and locals who hang out there. Unique architecture and the rustic ambience of Agrasen Ki Baoli is much favoured by Bollywood. Agrasen Ki Baoli has been featured in many movies and it has turned into one of the famous film shooting locations in Delhi.